Tummy time is an important part of your baby’s day- and is something all infants should do daily until they are of sitting and/or crawling age. Tummy time helps strengthen the neck and core muscles, so your baby can gain the muscle strength to sit, crawl, and walk unassisted. Now, I don’t know about your baby- but all of mine hated tummy time. Scream bloody murder hated! Especially when they were newborns. Once they gained some control, it got a little better. Until they learned to roll over and then it was a chore to keep them on their tummy at all! So how do you encourage a happy tummy time with your baby? You give them something to look at! So if you set them on their tummy with something in these high contrast colors in front of them, it helps them stay happy on their tummy longer. What I like most about this tummy time sensory bag is that it is soft- so if your baby is like mine, if they face plant into it when their neck gets tired, it won’t hurt them! That’s it- all you need. The bulk of the bag will be filled with cotton, the pom-poms are less to provide high contrast colors to draw your baby’s attention to. 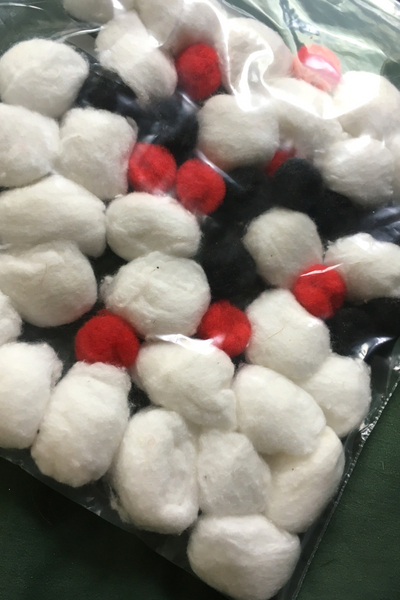 Open the bag and place the cotton and pom-poms inside. 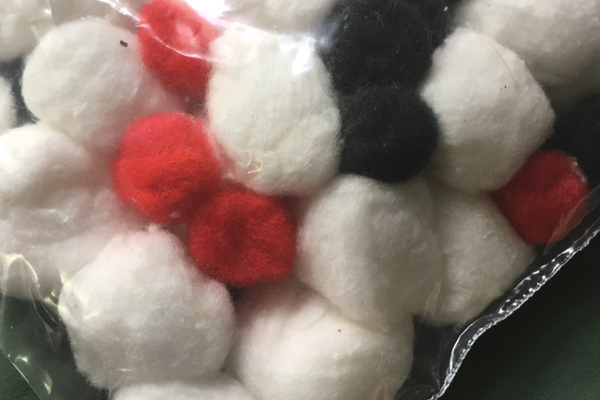 Spread out the cotton and evenly distribute the pom-poms throughout the bag. With the bag on it’s side, seal it up- pushing out as much air as you can. And you are done! Now it’s time for tummy time! This bag can be used for babies of all ages. 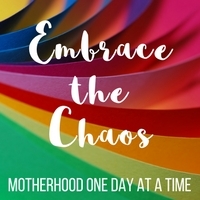 I’d say you’d get the most benefit from it with babies that are starting to grasp and can hold their heads up for a bit longer. Maybe 3 months old (give or take). With young babies that don’t like tummy time, placing them on their chest on top of the Boppy pillow, with their arms stretched in front of them can help. 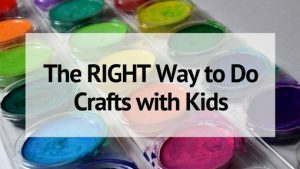 This gives them more height and helps them hold their head up longer. 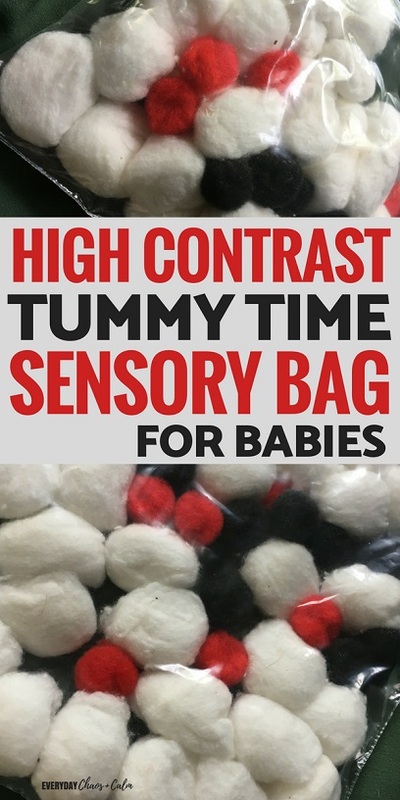 Place the sensory bag on the floor in front of the Boppy, under their hands. For older babies that are supporting themselves well with their arms, place the sensory bag on the floor in front of them, just out of reach. This encourages them to move and reach for the bag. They will wiggle and move their legs to try and propel themselves forward. Once your baby is older and grabbing more, you may want to tape up the end of the bag to prevent it from accidentally opening while your baby is playing with the bag. 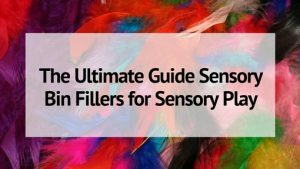 If you enjoyed this sensory bag, check out these 9 Sensory Bags for Babies (and Older Kids too!) 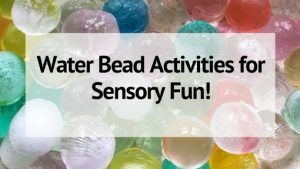 for more sensory bag fun!